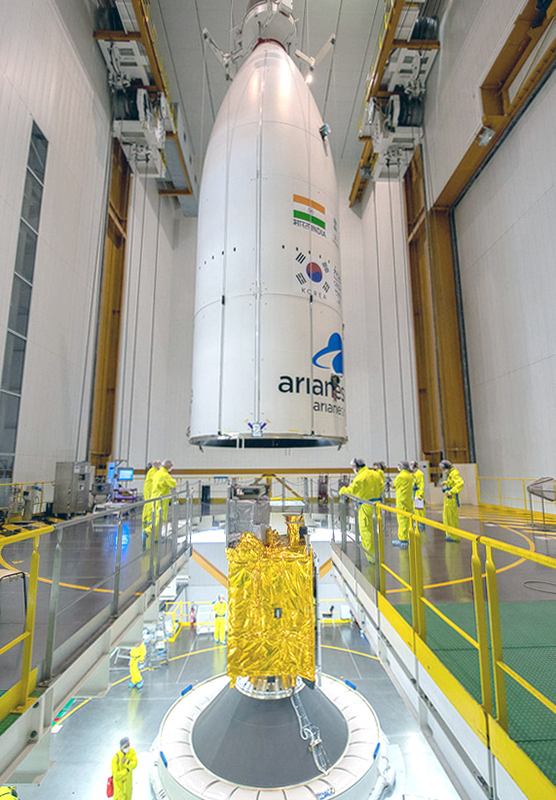 The ISRO- Indian Space Research Organisation GSAT -11 is the primary satellite that’s sitting in the upper section of the payload cradle of the Ariane five ECA Carrier rocket in which below cradle is the KARI – Korean Aerospace Research Institute GEO- KOMPSAT-2A …. The fifteen year old operational duration- ISRO- Indian Space Research Organisation GSAT – 11 in the provisionment is to provide the internet communications to the isolated areas in the Indian region, in which also providing whom it’ll be position at seventy four degrees East in a GEO- Geo Stationary Orbit.. The GSAT -11 is the largest also the heaviest of the Satellite that’s configured with the next generation I-6K structure, in which providing more coverage is the multi spot beam coverage over the Indian region also it’s islands.. The Second Satellite is a KARI – Korean Aerospace Research Institute GEO- KOMPSAT-2A in which will provide more for Earth Sciences, position at 182.2 Degrees East, with an operational cycle of ten years, it’s provisionment will provide the Asian pacific region to carry out Meteorological and space weather data observations in which its future twin sister GEO- KOMPSAT-2B will carry out Earth Environmental monitoring observations…. Manufactured by KARI- it’s the sixty eight Earth observation satellite …. ← #AlreadyTomorrowInHongKong #DiscoverHongKong | #香港 #HongKong #WestKolwoon | #XiquCentre set to officially open on the January 2019 for performing teaching #ChineseOpera …….